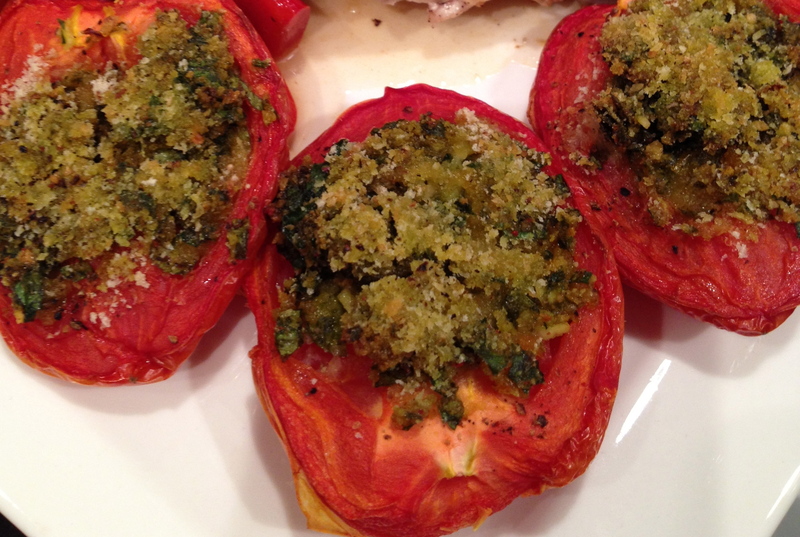 When you need a break from packing, unpacking and endless cleaning, I recommend you make Oven Roasted Tomatoes with Herb and Garlic Stuffing. When you need another break, it’s time to blog about this dish! It’s been a whirling-dervish-busy evening of cleaning around here, and I’ve decided I deserve a break. My blog has been woefully neglected during all the preparations for selling my house, so what better way to get away from it all than writing about the stuffed, roasted tomatoes I made yesterday. Winter tomatoes can pretty a sad and tasteless affair, but slow roasting brings out their flavour. Adding a zesty stuffing really ups the wow! factor too. They make a great side dish for Sunday dinner, in this case chicken breasts on the bone, roasted with a medley of peppers, garlic, sun dried tomatoes and white wine. Overall this dish was a great reward for a weekend of hard work. I vaguely recall that weekends and evenings used to be for something called relaxing, but I’m hopeful I’ll return to that state before long. Here’s how I went about assembling this dish. I really just threw ingredients into my little food processor to create the stuffing, so I’m using memory-based estimates for the recipe, but I’m confident this will work just fine for you! Slice the tomatoes in half, and remove the seeds and tough centre membrane. Place on baking sheet lined with parchment paper. 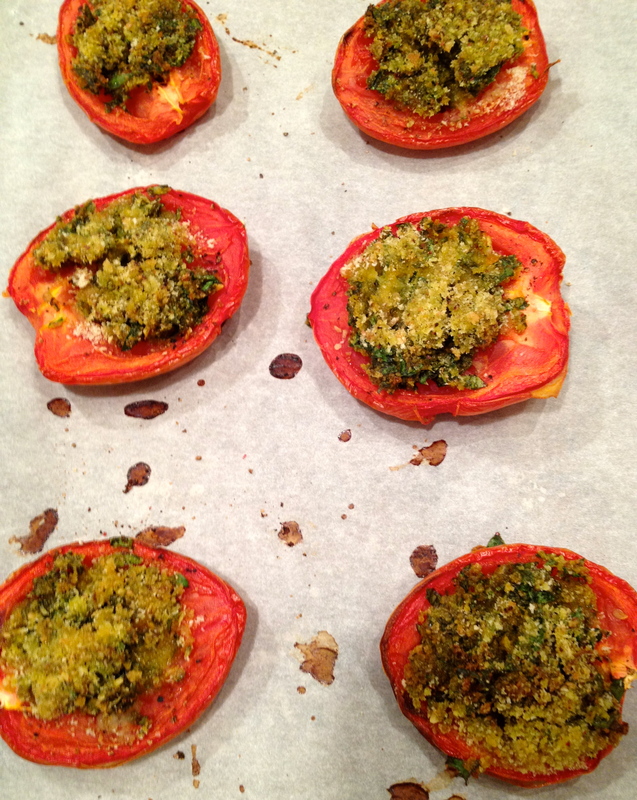 Put all ingredients except olive oil into small food processor and puree until finely minced. Season with a generous helping of pepper, then add olive oil in a couple of additions until a pasty texture is achieved. Divide the stuffing mixture among the 6 tomato halves, then top with a sprinkling of bread crumbs and perhaps a final grinding of pepper. Normally I would cook this dish at a low temperature for an extended period of time. Yesterday I roasted at 275° for 30 minutes, then at 350° for another 40 minutes after I added the chicken dish to the oven. These tomatoes add a burst of fresh flavour to a winter meal. I do hope you’ll enjoy them. As for me, back to work I go! 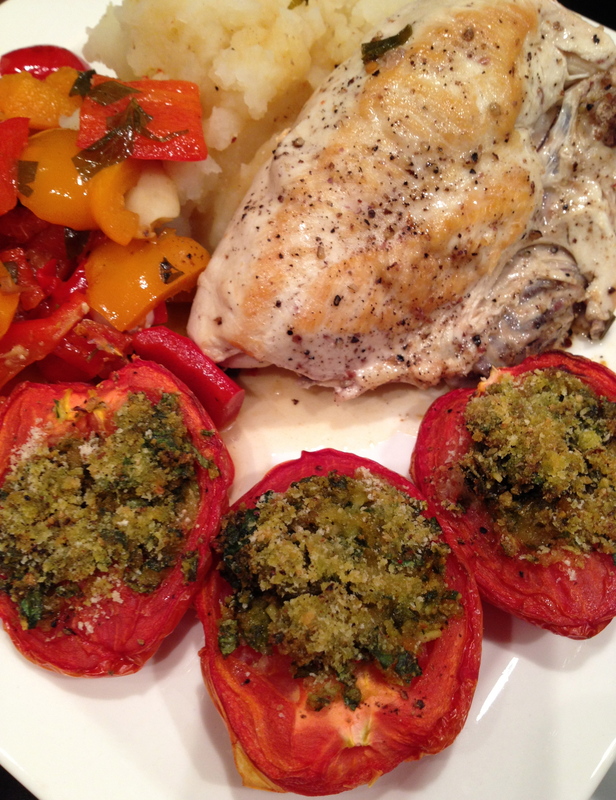 Delicious tomatoes and the chicken…wow!!! A good meal to end the weekend! These look delicious! My family makes a very similar dish, using the topping for eggplant and onions, as well as for tomatoes. I love ’em and I’m sure I’d love yours! I always make enough of the tomatoes to ensure leftovers. One tomato between 2 slices of bread makes a light & tasty lunch. 2 or 3 tomatoes, roughly chopped and re-heated, can dress some pasta with a little olive oil and grated cheese. I’m getting hungry here! It wouldn’t have occurred to me to use these tomatoes in a sandwich or for a pasta topping, but now that you mention it, what a great idea! I’ll definitely have to make a few extra next time.